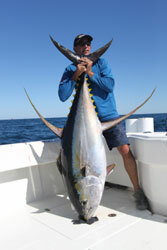 Capt Andy and his two fishing buddies Steve Palmo, and Mitch Wergiles finally made it back to Venice, LA to fish with Capt Scott Sullivan of the Mexican Gulf Fishing Company and experienced one of the most amazing yellowfin tuna bites ever! The guys rolled the dice on day two (after a decent, but not overwhelming day one) and headed to the east while the rest of the fleet went west. The seas were 4-6 and stacked, and no one was looking forward to running 50 miles to a rig where they knew there were fish. However, the guys ran across a bubble of perfect blue water less than 20 miles out that had numerous shrimp boats working it. Every single boat was covered in huge 30lb class blackfin tuna and monster bonito. There were also big yellowfin, but it took alot of effort to hand feed the yellowfin without something else grabbing it first. Despite all the competition, the big yellows were somewhat shy and the team had to rely on fairly light leaders and Mustad Demon Circle hooks to ensure a hookup and avoid being broken off. The guys ended up boating five yellowfin ranging from 110lbs to 168lbs.